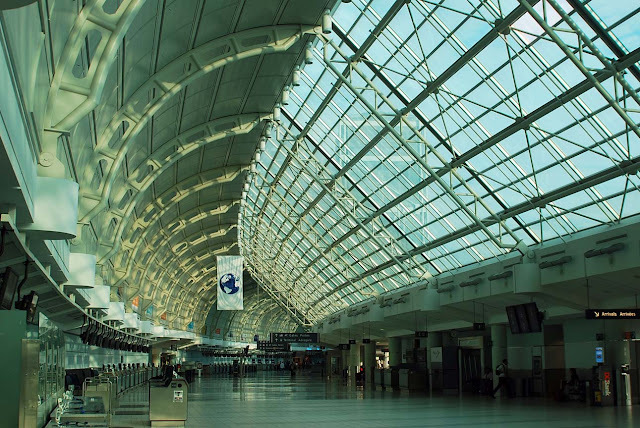 Toronto airport is a constant in Jacob McArthur Mooney's "Folk." The University of Wales Dylan Thomas Prize has revealed this year’s shortlist of five writers who are in the running for the £30,000 prize. Among the nominees is Canadian poet, Jacob McArthur Mooney. The Dylan Thomas Prize is one of the world’s highest paying literary awards for young writers in honour of the internationally esteemed work of Dylan Thomas, whose first book of poetry was published when he was 21 years old. The Prize is open to all published authors aged 18 to 30, writing in the English language from anywhere in the world and is open to a variety of genres, including short stories, novels, poetry and plays. Mooney is nominated for Folk, his second collection of poetry. The two sections in this virtuoso collection – one rural in orientation, one urban – open an intricate conversation. Taking as its inciting incident the 1998 crash of Swissair Flight 111 off the coast of Nova Scotia, and later moving on to the neighborhoods around Toronto’s Pearson International Airport. Folk is an elaborately composed inquiry by Jacob McArthur Mooney into the human need for frames, edges, and borders, and a passionate probe of contemporary challenges to identity, whether of individuals, neighbourhoods, cities or nations. The poet examines the fraught desire to align where we live with who we are, and asks how we can be at home on the compromised earth. This is poetry that poses crucial questions and refuses easy answers, as it builds a shimmering verbal structure that ventures “beyond ownership or thought”. Mooney’s distinctive voice is seriously unsettling, deeply appealing, and answerable to our difficult times. A respected poetry commentator and critic, Mooney is the poetry columnist for Torontoist.com and writes the popular Vox Populism blog. A Nova Scotian now living in Toronto, he is a graduate of the MFA in Creative Writing programme at the University of Guelph-Humber. His first book of poetry was The New Layman’s Almanac and he is also the recipient of the Banff Centre Bliss Carman Poetry Award. Joining Mooney on the shortlist are: Lucy Caldwell (The Meeting Point), Benjamin Hale (The Evolution of Bruno Littlemore), Tea Obreht (The Tiger’s Wife) and Annabel Pitcher (My Sister Lives on the Mantelpiece). The shortlist for the Prize, which is now awarded annually, consists of new and established writers including the winner of this year’s Orange Prize for Fiction, New York-based Obreht. “The previous three winners of the Prize, Elyse Fenton in 2010, Nam Le in 2008 and Rachel Trezise in 2006, have really seen their careers take off since receiving the award," commented Peter Stead, Chair of the Prize. "We’re looking forward to helping an equally talented writer to do the same." The 2011 University of Wales Dylan Thomas Prize will be awarded on November 9th in an exclusive ceremony in Dylan Thomas’ hometown of Swansea, South Wales.